The account’s Home folder: That specific account’s Home folder carries a short version of the username that’s in the Users folder on your hard drive. 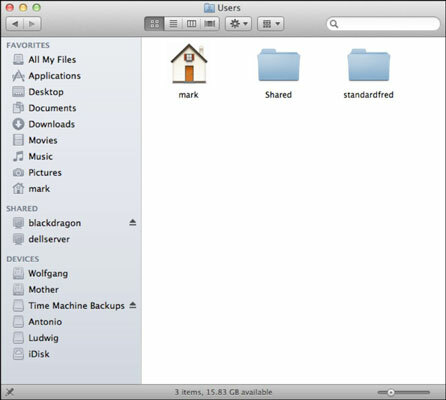 The Home folder is noted with an icon that looks like a house, for the mark account. The Shared folder: This folder is also in the Users folder on your hard drive. Anyone with an admin-level account on your Mac can access the Shared folder across the network, and any user account on your Mac can access the Shared folder locally, so it’s a great place to keep common files that everyone wants to copy or use. Open System Preferences from the Apple menu (Command) or the Dock. Click the Users & Groups icon. Click the New User button, which carries a plus sign. If the New User button is grayed out, you need to unlock the Users & Groups pane first. Click the padlock icon in the lower-left corner. If necessary, enter your admin-level user account password and click Unlock. Click the New Account pop-up menu and choose the account type. This can include Administrator (or Admin), Standard, Managed with Parental Controls, and Sharing Only. Fill in the appropriate information, including the name for the account and a password. Note that the name that appears as the short name determines the name of that user’s Home folder. Press Command+Q to exit System Preferences.